Last night my camp neighbour, Macca, invited me over for dinner. He had been staying here for about 20 nights and will be leaving soon. To celebrate he was cooking a roast on the campfire. Have to say he is a pretty good cook. The food was yummy and we chatted around the fire till about 11pm. This morning I was awoken by the kookaburras. Such a great way to be woken up. I was riding at about 8.30am. A couple of kms down the road I began a nice climb up. The climb was about 500m over 12km, so quite a nice gradient. Once at the top I followed the ridge until it opened up to farmland. Everywhere I looked there were hills. I continued until I saw the sign for the turnoff to McKillop Bridge. Which was about another 55kms away. The road turned to gravel and slowly began my descent. The surface was generally good, just needed to slow down a bit through the corners. As generally one side (usual near side) was a bit corrugated. I stopped at Tubbut for lunch. It is a small village (no shops) with a nice shady area to eat. It was then just under 30kms to my destination. I got to McKillop Bridge at around 3pm. The bridge is a large single span bridge. It is very impressive. I am camping just on the other side of the bridge, near the river. I had a swim in the river once I was all setup. The water here is a lot warmer than yesterday's swim. After I got the campfire going to cook up dinner. Today has been great. Fantastic scenery and hardly any cars. I think I saw no more than about 6 cars today. 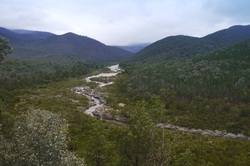 Tomorrow I'll be following the Snowy River and will hopefully find another great camping spot. When I got up this morning I noticed the fire was still quite warm from the night before. So it didn't take long to restart a small fire for breakfast. Once I was fed and packed I was riding at around 8.30am. It was still sunny but I noticed a bit of cloud in the distance. This would keep it nice cool for later. The road began climbing and kept climbing for the first 10 or so kms. The grade was generally good, but sometimes steep at spots (12%-15%). But besides a group of 4WD's going past, it was quiet. I stopped at Little River gorge, which is about 400m off the road. It's a pretty gorge. After I rode a little further and stopped at Little River Falls. It was a short walk from the road. By the time I was back on the bike it had become cloudy. I was now cycling past cattle before re entering the forests. At the turn off for Barry's Way, the road began climbing again. There I had a nice downhill into Suggan Buggan. I stopped here for a short break. They have restored the old school which was built in the 1860's. 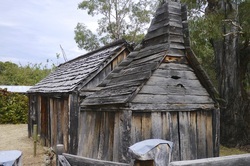 It was tiny, more like a rustic shed. After Suggan Buggan I had one last major climb for he day. This went for about 4kms before another good downhill took me to the Snowy River. I stopped at Willis campground, which is just south of the NSW border. The campground is right next to the river. Once I had setup for the night I had to have another swim. I am really enjoying the swims each day. I also got some water from the river. As all I'll need to do is boil some for tomorrow for drinking and use some tonight for cooking. Today has had a lot climbing. About 1900 metres of climbing. The funny thing is that I have only gained about 100 metres elevation compared to last night's camp-spot. Tomorrow I'm heading for Jindabyne. It rained a little last night and this morning. It didn't rain enough to stop me from having a campfire again though. After breakfast I was riding at about 9am. For the first 20kms the road followed the Snowy River. I had great views throughout. This has to be one of the most scenic rides I have done, so far. At Jacobs River the road begins to climb. It was a good steady climb up. I stopped for lunch at Wallace Craige lookout. I had a great view of the road I had just been riding up. After lunch I still had a bit more climbing to do. Once I was over the 1000 metre mark I entered the cloud cover. It was very misty and a lot cooler. But climbing kept me warm. After about 55kms of riding on dirt today I was back on the black stuff and going, mostly, downhill. So the last 20kms went really quickly and I got to Jindabyne at around 4pm. I'm staying at the youth hostel here. It seems nice and is very quiet. I'll be here for three nights. Tomorrow, weather permitting, I'm riding up to Mt. Kosiszuko. The last few days camping along the Snowy River (and others) have been some of the best spots I have had the pleasure to enjoy since bike touring.